The U.S. 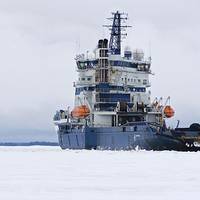 Interior Department on Friday said it would cancel two potential Arctic offshore lease sales after Royal Dutch Shell PLC said that it was not interested in those leases. "In light of Shell's announcement, the amount of acreage already under lease and current market conditions, it does not make sense to prepare for lease sales in the Arctic in the next year and a half," Interior Secretary Sally Jewell said in a statement. Shell said last month it was giving up its Arctic search for oil after failing to find enough crude oil. Royal Dutch Shell's quest to return to Arctic drilling for the first time in three years could face delays after Seattle ruled that the city's port must apply for a permit for the company to use it as a hub for drilling rigs. Seattle Mayor Ed Murray, a Democrat who has fought against new projects by coal and oil companies, applauded the requirement by the city's planning department. "This is an opportunity for the port and all of us to make a bold statement about how oil companies contribute to climate change, oil spills and other environmental disasters - and reject this short-term lease," Seattle's Mayor Ed Murray said on his website. The Puget Sound region has a decades-long history as a hub for equipment used in energy drilling in Alaska. Royal Dutch Shell is pushing ahead with plans to explore for oil in the Arctic Ocean near Alaska this summer despite opposition from environmental groups. 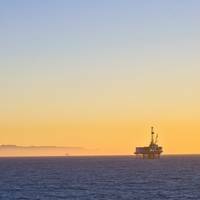 The Anglo-Dutch oil major is preparing "an armada of 25 vessels" to begin a two-year programme to explore two to three wells in the Chukchi Sea off the coast of Alaska, Chief Financial Officer Simon Henry said on Thursday. "We are currently on track. Some of the permits are issued at the last moment," he told reporters. Although Shell had to pull out of the region in 2012 after an oil rig ran aground, the Arctic oil reserve "remains a massive value opportunity," Simon said. Shell has submitted plans to explore the Arctic to the U.S.
U.S. In response to the findings of investigations into the Deepwater Horizon tragedy, and following a thorough evaluation of recommendations from industry groups, equipment manufacturers, federal agencies, academia and environmental organizations, Secretary of the Interior Sally Jewell announced proposed regulations to better protect human lives and the environment from oil spills. The measures include more stringent design requirements and operational procedures for critical well control equipment used in offshore oil and gas operations. Royal Dutch Shell Plc said it has filed a complaint in federal court in Alaska seeking an order to remove Greenpeace activists who climbed aboard an oil rig in the Pacific Ocean bound for the Arctic on Monday in a protest against Arctic drilling. The environmental group said in a statement its team would occupy the underside of the main deck of the Polar Pioneer, which is under contract to Shell, and plans to unfurl a banner with the names of millions of people opposed to Arctic drilling. The group said the activists would not interfere with the vessel's navigation. "We're here to highlight that in less than 100 days Shell is going to the Arctic to drill for oil," 32-year-old Johno Smith, one of the six to board the Blue Marlin, the ship carrying the rig, said in the statement. Feds issue Interim Guidelines for reefing old rigs at the same time that NOAA identifies myriad potentially polluting shipwrecks. Salvage opportunities abound. In late June, the U.S. 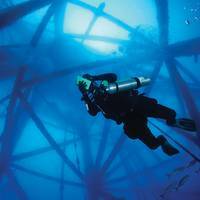 Interior Department revised its interim policy for defunct, offshore oil-and-gas platforms, making it easier to turn them into artificial reefs under an initiative by the agency’s Bureau of Safety and Environmental Enforcement or BSEE. 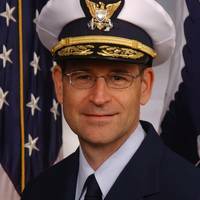 Separately, and at virtually the same time, a new NOAA report that examines national oil pollution threat from shipwrecks has been presented to the U.S. Coast Guard. BP Plc.’s Atlantis platform, its second-largest oil producer in the Gulf of Mexico, should be shut down until it’s proven to comply with U.S. safety and environmental laws, a lawyer for a whistle-blower told a judge. BP misled U.S. offshore regulators to win operating permits for its Atlantis platform, about 150 miles (240 kilometers) south of New Orleans, according to the whistle-blower. The facility produced an average of 60,000 barrels of oil daily last year and is capable of producing as much as 200,000 barrels a day, according to data on London-based BP’s website. “Atlantis is presently not fit for service under normal engineering standards,” David Perry, a lawyer for former BP contractor Kenneth Abbott, said at a hearing in federal court in Houston. Governor Sean Parnell has directed the Department of Law to ask the Ninth Circuit Court of Appeals for permission to intervene in the lawsuit by environmental groups challenging the U.S. 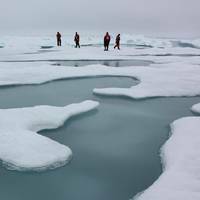 Interior Department’s decision to approve an oil exploration plan for the Chukchi Sea. “OCS exploration and development will increase jobs and revenue for Alaskans and for all Americans,” Governor Parnell said. The state previously was granted intervention in a separate case brought by many of the same plaintiffs against an exploration plan for the Beaufort Sea. In both cases, the state has sought intervention due to the economic importance of offshore oil and gas production. Lift boats are the unglamorous vessels of oil and gas well servicing industry. They travel to the job site with three large cylindrical legs rising 150-250 ft. above the waterline. Once onsite, lift boats lower their legs to the seabed and raise their hull up to 100 ft. above the waterline to be even with the structure they are servicing to provide a stable platform for workers to transit from the lift boat to the project in which they are working. These versatile vessels can serve through the entire life of a oil or gas well from driving casing to provide a "path" for a jackup rig to drill through construction of the platform, repair and renovation of the platform to plug and abandonment of the well. The U.S. Interior Department's Minerals Management Service (MMS) will reportedly delay its decision on whether oil companies can drill for oil and natural gas off California's coast. According to reports, U.S. and Mexican oil and natural gas producers evacuated some offshore Gulf of Mexico platforms and rigs, curtailing output as Hurricane Dean whipped past Jamaica heading towards the Yucatan Peninsula. Six of the 834 manned oil and natural-gas platforms along the U.S. Gulf Coast have been evacuated, the U.S. Interior Department's Minerals Management Service said Sunday in a statement. That's shut about 1.8 percent of the Gulf's 1.3 million barrels of daily oil production and 0.7 percent of the region's natural gas. Royal Dutch Shell Plc evacuated 380 workers Saturday, the company said in a statement. Shell has shut production in the Gulf by 23,000 barrels of oil and 47.5 million cubic feet of natural gas per day. According to Reuters, the U.S. House of Representatives will not accept legislation passed by the Senate that keeps most U.S. Atlantic and Pacific waters off-limits to energy exploration, a key U.S. Republican lawmaker. Comments by Rep. Joe Barton of Texas, chairman of the House Energy Committee, indicate dimming prospects that the energy legislation will pass Congress this year. House Republicans will not concede to Senate lawmakers' calls to accept an offshore drilling bill that expands energy exploration only narrowly, he said. Barton's comments to reporters at the Independent Petroleum Association of America's annual meeting signal tough going for offshore drilling legislation once Congress returns for a short voting session after the Nov. 7 mid-term elections. The U.S. Outer Continental Shelf, according to a Reuters report. However, Interior Secretary Gale Norton said she would uphold a White House promise and not offer any federal leases through 2012 within 100 miles of Florida's coast. The new U.S. areas of the Outer Continental Shelf. tourism industries. the government develops its 2007-2012 leasing plan. five-year leasing program expires on June 30, 2007. Public comments are due by Oct. 11 . four states -- Alaska, Alabama, Louisiana and Texas. federal offshore waters. leases. according to government estimates.